A couple of months after we got married my husband and I started talking about having a child together. We wanted to have the experience of creating a life together and we thought Lillia might like a sibling someday. Little did we know that we would conceive almost immediately. We were really excited but we didn’t tell anyone at first. By the 10-week mark I just couldn’t stand it anymore. I had awful morning sickness, and I wanted to be able to complain out loud. I had to start telling people! We told our daughter first because it seemed like the right thing to do. Seven year-olds don’t keep secrets very well so we knew that EVERYONE would find out. 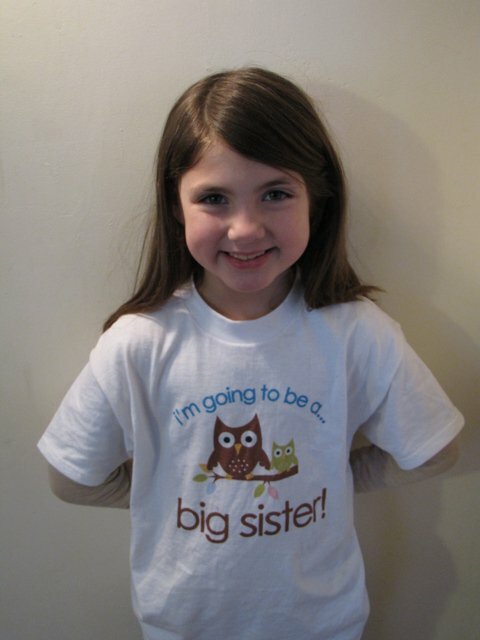 We tried to be creative in how we broke the news to her, so we bought her a shirt that said “I’m going to be a big sister!” At first she was clueless. When she finally figured it out she was very surprised, and excited to be the one to spread the good news to her grandparents. Lillia as the bearer of good news. I knew from the start that I wanted to have a waterbirth. Lillia was born in the water and it was the best part of my labor and delivery experience (see Lillia’s Birth Story). Unfortunately, the closest hospital, and the one where my daughter was born, no longer offered waterbirths. We started looking at other options. I found a place called Monadnock Birth Center, which is a free-standing birth center run by a midwife named Mary Lawlor. We met with Mary and fell absolutely in love with the center. It looks like a five star hotel! The “sunset room” at the birth center where Zane was born. One of the challenges I faced in my pregnancy was that I knew that there would be no pain medication available at the birth center, and I was pretty apprehensive about whether or not I could do a natural birth. I had an epidural during my very long labor with Lillia, though it had worn off by the time I delivered her. The thought of a 100% natural birth sounded great, in theory, but I was worried that in practice it would be too much for me. Mary knew I was nervous so she recommended that I take Birthing From Within classes at the center with another midwife, Annique Sampson from The Birth Garden. Damian and I at our birth class. The Birthing From Within classes were so therapeutic and so healing. I hadn’t realized how traumatized I was after my first birth experience. I was carrying so much baggage! Annique and the other couple in our class were so wonderful in helping me work through my fears. For Damian, who was going to be a birth partner for the first time, the classes helped him to prepare for that experience. I highly recommend these classes, if they are offered anywhere near you. I also spent a good deal of time listening to the HypBirth program on CD. During my actual labor I didn’t use it much because it was too distracting, but I really loved the affirmations at the end of each section, and I could hear her saying them in my head while I was in labor. 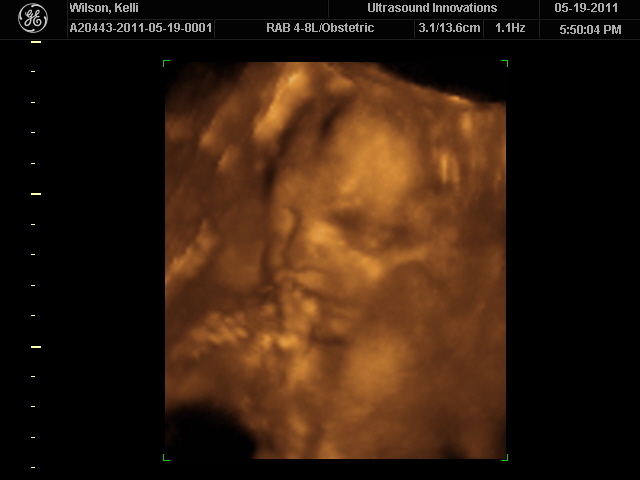 An image from our 3D ultrasound at 27 weeks. A little slideshow of my baby belly getting bigger and bigger. At about one o’clock in the morning on the ninth day I started having contractions, and they just kept coming. They weren’t overly intense, but I was so excited that I couldn’t go back to sleep. I sneaked out to the living room and colored in my mandala coloring books (that I bought especially for the occasion). I didn’t want to wake my husband because I wanted him to be well-rested in case it was a long labor. At six o’clock in the morning I went into the bedroom and said to my husband, “You aren’t going to work today!” He seemed excited and relieved that we were finally going to have the baby! We walked around the neighborhood a lot that morning but I eventually decided that I just wanted to sit and rest. My daughter had an open house at school that afternoon because it was the day before school was starting (great timing, Zane!) and it was a chance to meet and greet everyone. Even though I was in labor I decided to go because I knew I wouldn’t have a chance to meet her teacher the next day. I figured I was probably still going to be in labor or giving birth (based on my last long labor). While we were at the school there was a little earthquake, which is really unheard of in our area of the country. After about a half an hour at the school I decided I needed to go home. My mom took Lillia home with her, and my husband and I headed home to watch a movie. It was around three o’clock in the afternoon and we were watching “Before Sunrise,” when my contractions suddenly became really strong. My midwife had advised me to watch for a change in intensity and I knew this was it. I had to really concentrate on my breathing! We turned the movie off and called the midwife. I didn’t learn this until after Zane was born, but this was the exact point in the movie when Céline and Jesse see a woman doing a birth dance. Coincidence? I think not! I proceeded to go through lots of contractions just sitting up on the bed and breathing. I was handling it pretty well. At some point Damian left to get something to eat. By eight o’clock or so I was getting pretty uncomfortable. I kept thinking I had to pee but when I would get there I would just have back to back contractions. At one point in time I think it took me a good five or ten minutes just to get off the toilet. Finally, desperate to get comfortable, I tried to sit on the floor. Big mistake! I ended up on my hands and knees, throwing up into a bucket. I thought to myself, “I cannot, simply cannot, go through twelve more hours of this.” Mary came back in the room and saw my condition. She checked me and, to my surprise and relief, I was over 8cm dilated! All of that throwing up and non-stop contractions was transition. I was so, so, so excited. I got a huge rush of energy and I was really ready to bring this baby into the world. Although pushing isn’t comfortable it’s a different kind of discomfort from contractions, and I was so looking forward to seeing my baby. Mary said it would be a good time to get into the birth tub and, let me tell you, nothing has ever felt so heavenly. I spent so much time in the water during Lillia’s birth that I don’t think I got the therapeutic effect as much as I did when I waited until the very end with Zane. With a couple more pushes his head was out. I tried to push his body out but couldn’t. I said to the midwife, “Is it okay for his head to be like that? Just sticking out?” And, she assured me that it was fine. His body was rotating. With the next contraction Zane was born. He spun out into the water and my husband caught him and pulled him out. He had the cord wrapped around his neck, so Damian and Mary unwrapped it, and then they gave him to me. Mary popped a little hat on him, and I got to hold him in the water for a few minutes. He was absolutely covered with vernix so I thought he was early, but I learned later that perfectly on-time babies usually have the most vernix. It was so amazing to finally meet my baby and to know that I had, essentially, birthed him all by myself. It was a beautiful birth – more beautiful than I ever could have imagined. My husband cut the cord and we moved to the bed, where I got to nurse Zane for a long time. Damian’s parents came to the birth center even though it was after ten o’clock at night. It was their first biological grandchild and they were really excited. We stayed for another three hours or so and then we went home. It was so nice to go home and not be stuck in a hospital bed for another two days. I got to rest in my own bed and my parents were able to see Zane because they were at our house taking care of Lillia. For me having a natural birth at a birth center was about doing what was best for me and the baby. Not everyone was thrilled with our decision at first, but most of them came around. In the end I know that I gave Zane the best start in life – a gentle, drug-free birth. And, I have a truly positive birth story to share with other mamas. I am amazed at the depth of my inner strength and overcoming my fear of natural birth was life-changing in a very positive way.